Marnie was another of the many ground crew personnel who worked at Station 174. He was one of the men on the ground who kept the men in the air. They were responsible for servicing and maintaining the bombers including engine changes and repairing battle damage – mostly splinter holes from German anti-aircraft fire. 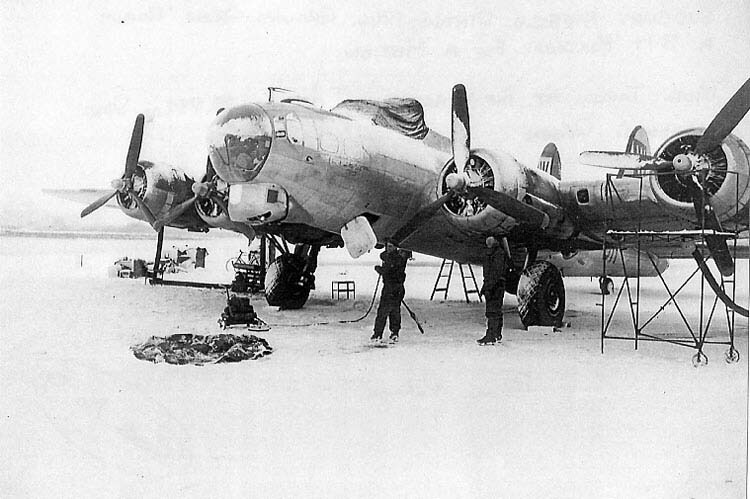 The two large maintenance hangers on the airfield could only accommodate a maximum of twelve “Fortresses” at a time so much of this maintenance work had to be done at the aircraft dispersal points out in the open air, sometimes with snow on the ground and in freezing temperatures. In January 1945 before every mission hundreds of ground crew also had to be out on the airfield sweeping the snow off the wings and spraying the planes with de-icing fluid. Clearly, this coloured his memories of his time here!